Here at Eloquentia we live in a remote farmhouse as you can see in the pictures on the website. Living remote means living far away from all kinds of services. Far away from the water supply, far away from natural gas and far away from power lines. In English you can say: the house isn’t on the mains. Mains means ‘the system of pipes or wires that carry water or electricity into a house’. You can also say the house is off-grid. It’s off the grid, it’s not connected to any network (=red). How is it to live off-grid? Well, I have to say we’re quite comfortable with it and we hardly notice any disadvantages. Okay, it’s perhaps more comfortable to be on the mains, like most people are, but in our case it’s definitely environmental friendlier. So, how do we supply ourselves with electricity? I will start answering this question with some vocabulary: in Spanish you say ‘luz’, but in English you can´t use the word ‘light’ in this context. The two most common words to use in English are power and electricity. Here at Eloquentia we use solar panels and solar batteries. 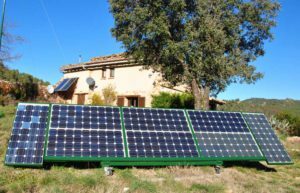 It’s a photovoltaic system: the solar panels transform sunlight into electricity which is then stored in big batteries where it stays until we need it in the house. The capacity of the batteries is not unlimited like mains electricity, so we have to be aware of our power consumption, especially when it’s cloudy. Besides, it is better not to use big power consumers like a dishwasher, an electric oven or a hair dryer. And what happens if there is no sun for a couple of days? Well, if we save power we can survive three days on full batteries. If it is still cloudy on the fourth day we have to connect a generator to the batteries to charge them. What about our water supply? Since we don’t receive any water from the village, we collect our own rainwater from the roof. We have four storage tanks around the house where we store the rainwater. It usually rains here only in autumn and spring so it’s important to have full tanks at the start of the summer season. One tank is specifically for the house and we make sure to keep this water clean at all times by disinfecting it. We use the other three tanks to store water for the decorative garden and the vegetable garden. We use firewood to heat the house and a solar boiler to get hot water. The solar boiler produces enough hot water for the kitchen and the four bathrooms, especially in summer, the season when most of our guests are present. So don’t we use gas at all? Yes, we do use gas for cooking and as a back-up for the solar boiler when there’s not enough sunlight.